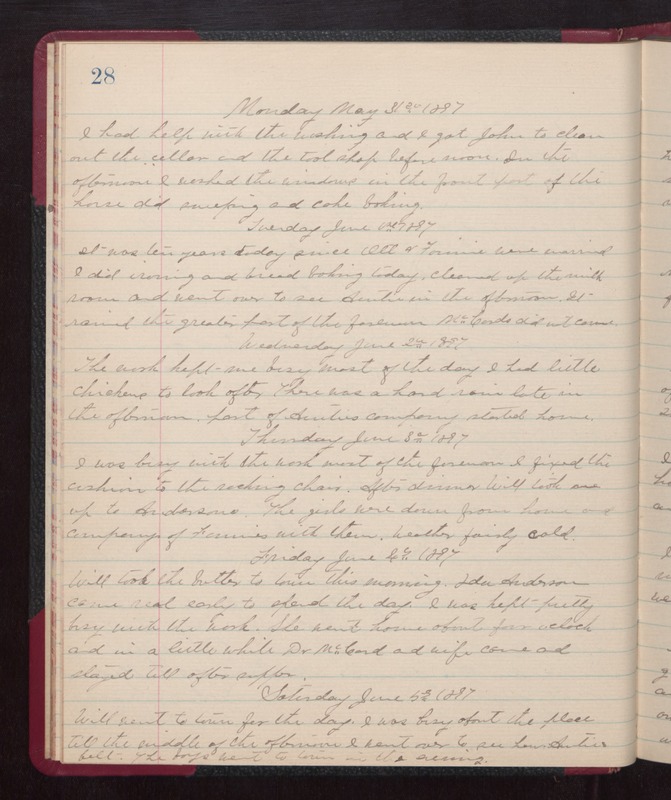 Monday May 31st 1897 I had help with the washing and I got John to clean out the cellar and the tool shop before noon. In the afternoon I washed the windows in the front part of the house, did sweeping, and cake baking. Tuesday June 1st 1897 It was ten years today since Ott & Fannie were married. I did ironing and bread baking today, cleaned up the milk room and went over to see Auntie in the afternoon. It rained the greater part of the forenoon. McCords did not come. Wednesday June 2nd 1897 The work kept me busy most of the day. I had little chickens to look after. There was a hard rain late in the afternoon. Part of Aunties company started home. Thursday June 3rd 1897 I was busy with the work most of the forenoon. I fixed the cushion to the rocking chair. After dinner Will took me up to Andersons. The girls were down from home and company of Fannies with them. weather fairly cold. Friday June 4th 1897 Will took the butter to town this morning. Ida Anderson came real early to spend the day. I was kept pretty busy with the work. She went home about four oclock and in a little while Dr McCord and wife came and stayed till after supper. Saturday June 5th 1897 Will went to town for the day. I was busy about the place till the middle of the afternoon. I went over to see how Auntie felt. The boys went to town in the evening.